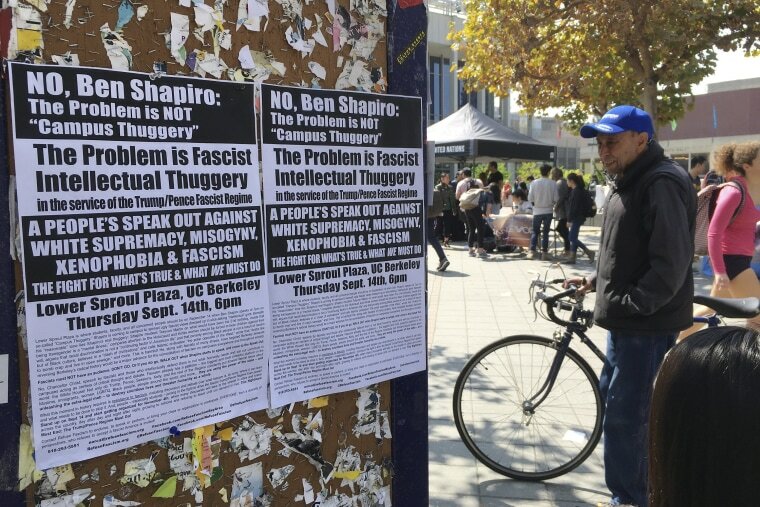 BERKELEY, Calif. — The University of California, Berkeley has ramped up security as it braces to host conservative commentator Ben Shapiro Thursday night, the latest polarizing figure to raise concerns of violence on the famously liberal campus. Authorities plan to seal off the campus' central hub, Sproul Plaza, with a "closed perimeter" around several buildings including where Shapiro is scheduled to speak to a sold-out, 1,000-person audience. There will be "an increased and highly visible police presence," the university said in a statement. For the first time in two decades, officers have been authorized to use pepper spray to control violence after the city council modified a 1997 ban at an emergency meeting this week. Berkeley city police chief Andrew Greenwood said officers would make "very strong, rapid arrests" of protesters wielding weapons and wearing masks. The city and campus at UC Berkeley have become a flashpoint for the country's political divisions, drawing extremist groups from the left- and right-wing. Four political demonstrations have turned violent in Berkeley since February, prompting officers to come up with new strategies to control rowdy and sometimes dangerous crowds. The Berkeley College Republicans invited right-wing provocateur Milo Yiannopoulos to speak last February, but the event was abruptly canceled when masked left-wing anarchists rioted outside the event to shut it down. Tighter, new security measures are expected to disrupt campus life Thursday and later this month, when Yiannopoulos says he plans to hold a "Free Speech Week" on campus with a lineup of controversial figures including Ann Coulter and Stephen Bannon, Trump's ex-chief strategist and head of Breitbart News. Thursday's event is being watched as a warm-up act for later this month, although campus officials say the event later this month is not yet confirmed. Sociology professor Michael Burawoy, who is chairman of the Berkeley Faculty Association, says there is growing frustration over the disruptions. "There are faculty who don't think the campus should be the site of this, what they call, political circus," Burawoy said, adding that the headline-grabbing visits by controversial speakers put the university in a no-win situation. "We bring them on campus and allow them to speak and we encourage both right- and left-wing groups" to hold potentially violent protests, he said. "If we exclude them, they say Berkeley doesn't believe in free speech. It's a lose-lose situation."